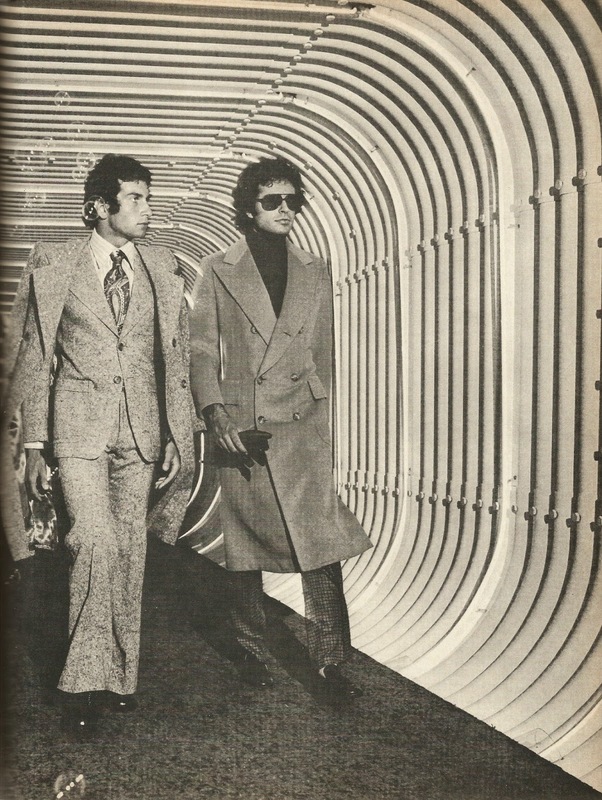 Tomorrow's man near right, shows the way in a tweedy salt-and-pepper suit teamed with a matching overcoat by Daniel Hechter. His partner in elegance wears camel-colored cashmere over a chocolate turtleneck with plaid pants in coordinated tones of camel and chocolate - all by Ralph Lauren. Still on a coat theme; the return of the wrap: "McMichaels" by P.J. 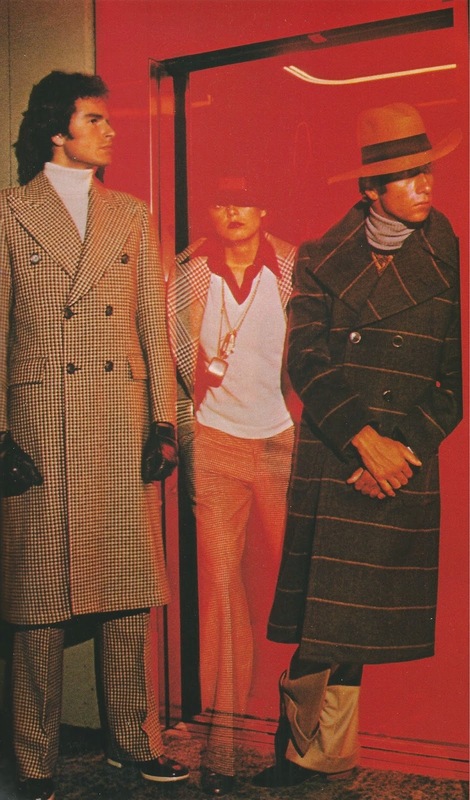 Michaels, slacks by Pierre Cardin. Giovannelli turtleneck. 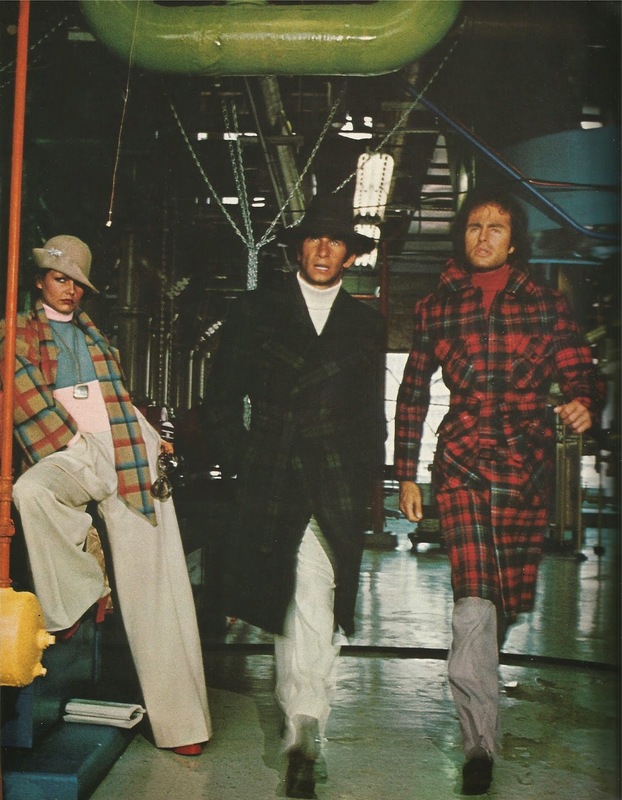 Right: shirt-styled blanket-plaid wool coat by Crown Climatic, DeNoyer turtleneck, slacks by McMurray. 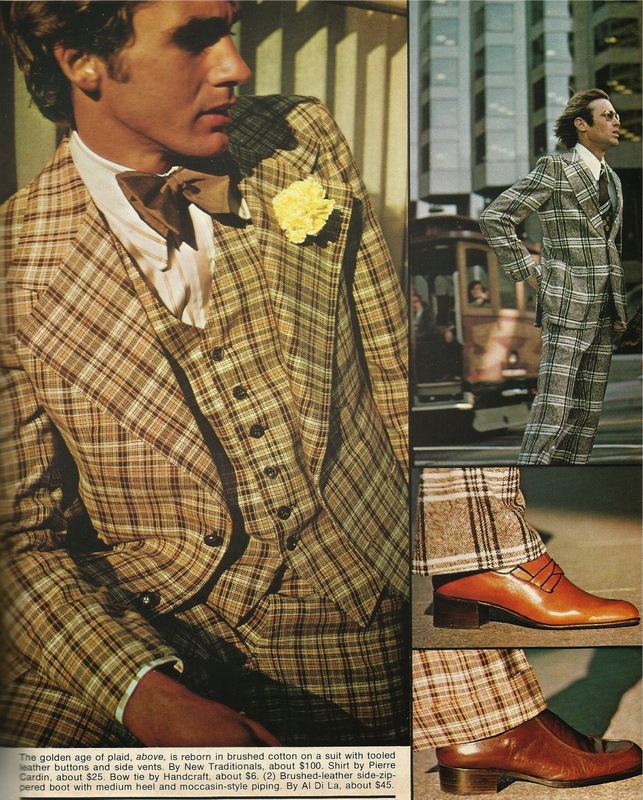 Top coat with matching trousers by Kenneth Mark of Paris. Cashmere turtleneck by Dimitri of Italy. Kidskin gloves lined in silk by Mark Cross. The High-style of low-key plaid is reflected in the windowpane check wool overcoat by Dimitri of Italy. Soft wool slacks by Raphael. Suit-up casual next to the Bradbury Building in Los Angeles. 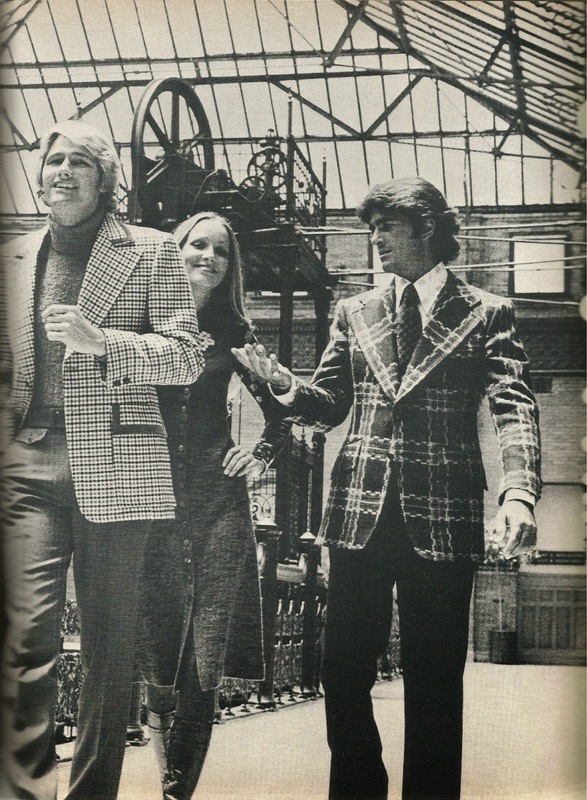 Plaid sport jacket trimmed with suede by Rubin Bros. International Fashion is teamed with olive gabardine slacks "Trousers by Barry." Olive turtleneck by Jockey. Navy basket-weave sport jacket with camel-and-red overplaid worn with navy worsted slacks and a white shirt with a geometric motif in gray and burgundy and bright red tie with dots - all by Oscar de la Renta. A closer look at plaids: brushed cotton suit with leather buttons by New Traditionals. Pierre Cardin shirt, bow tie by Handcraft. The brushed-leather side-zip boot with medium heel and moccasin-style piping is by Al Di La. Right: the British way with plaided tweed by Authentic Imports. Shirt by Eagle. Tie by Principe. The shoes, smooth-leather slip-ons with interwoven cross-strap by French Shriner. Watching the sun set on Malibu Beach. 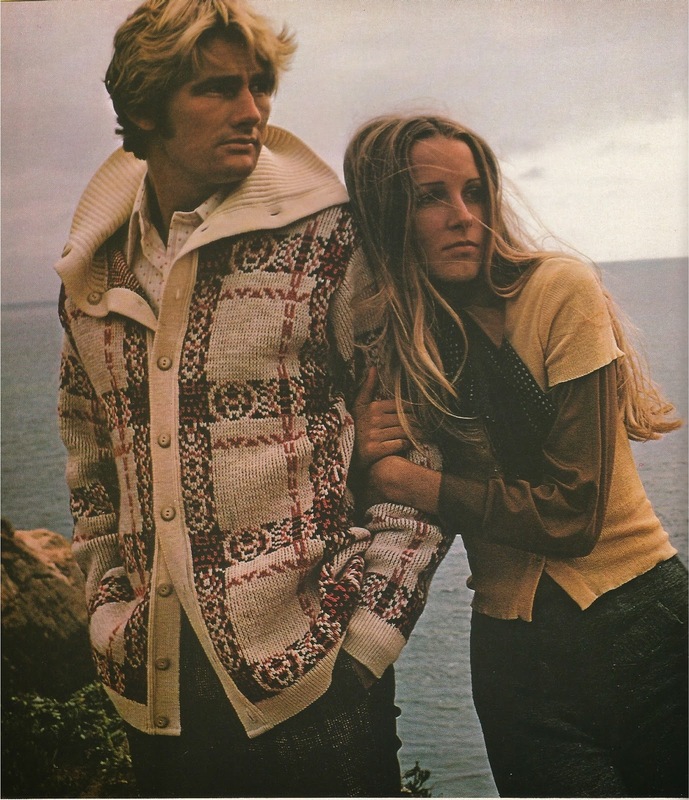 Basque-patterned cardigan with a shawl collar that converts to a turtleneck, by Pendleton. Career Club Shirt. Jeans by Live Ins. 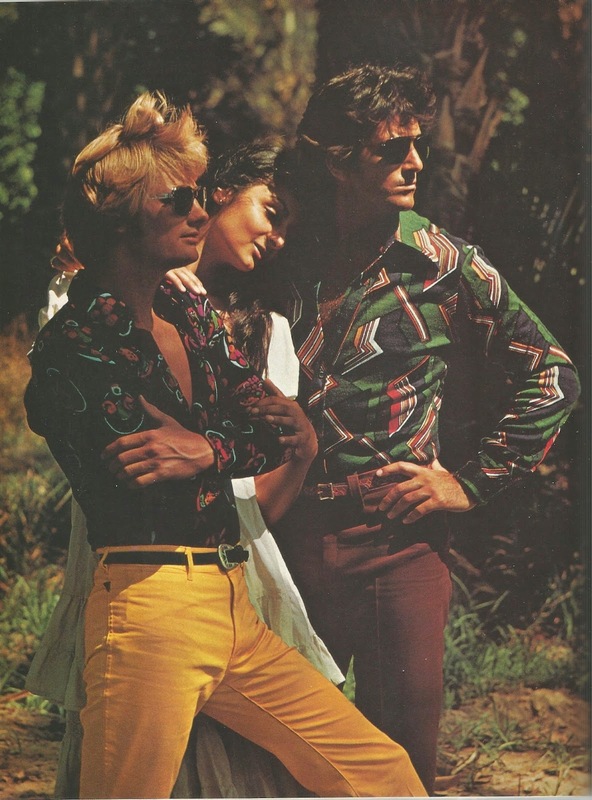 In a Palm Springs date grove, a fruit salad-inspired shirt by Madman Shirts. 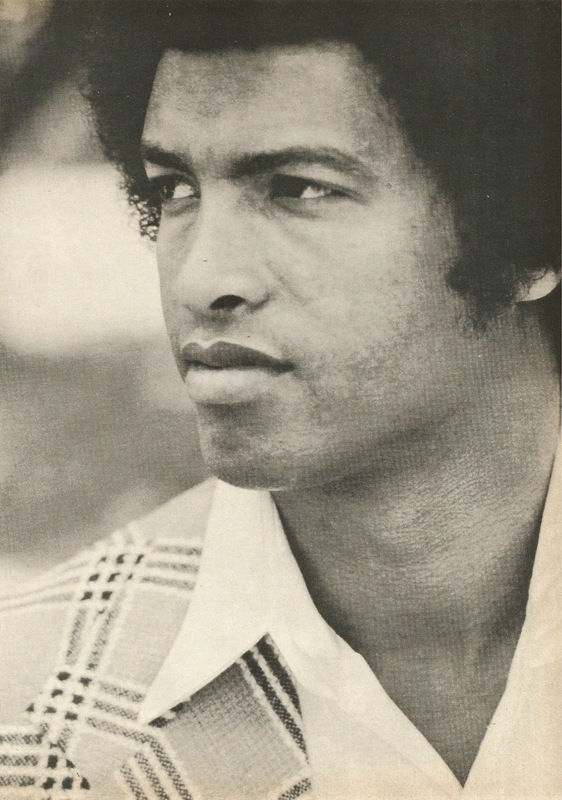 Jeans by New Man for Jackie Rogers. Suede belt by Robert Salomone for Crystal Belts. Art deco shirt by Geno. Slacks by Cloisters Diffusion. Handtooled Heart of the Country belt. 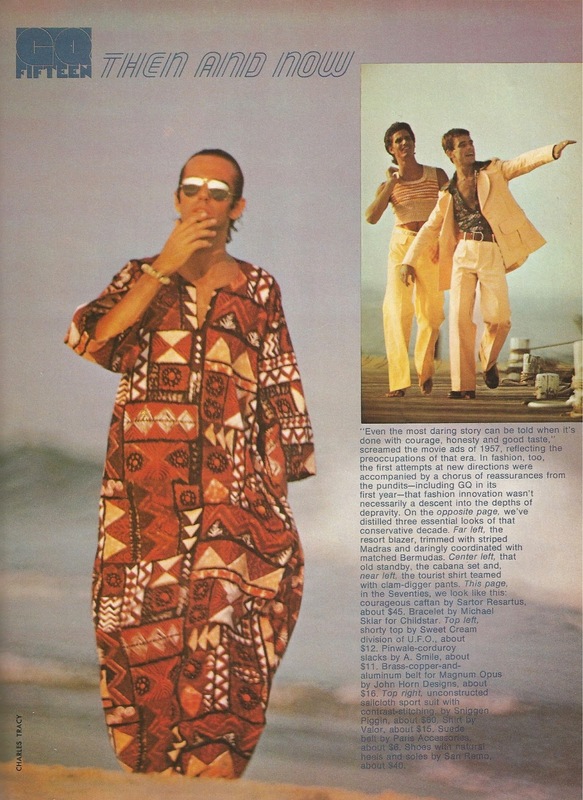 Caftan by Sartor Resartus. Bracelet by Michael Sklar for Childstar. 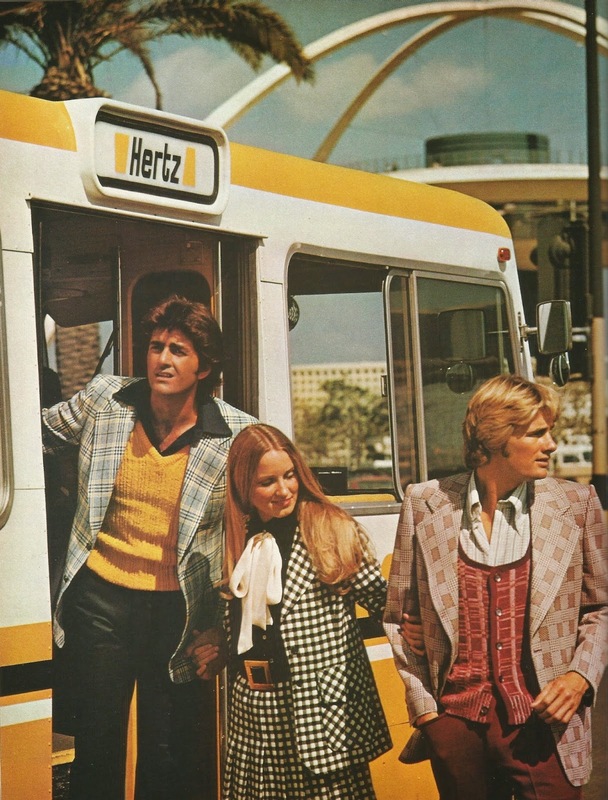 At the L.A. Airport, a hacking-pocketed blazer with single pleated slacks, knit shirt, and slub-weave sweater, all by Larry Kane for Raffles Wear. The double-knit sport coat to the right worn with complementing slacks are by Ratner. The sleeveless cardigan is by Columbia Knit. Shirt by Enro. 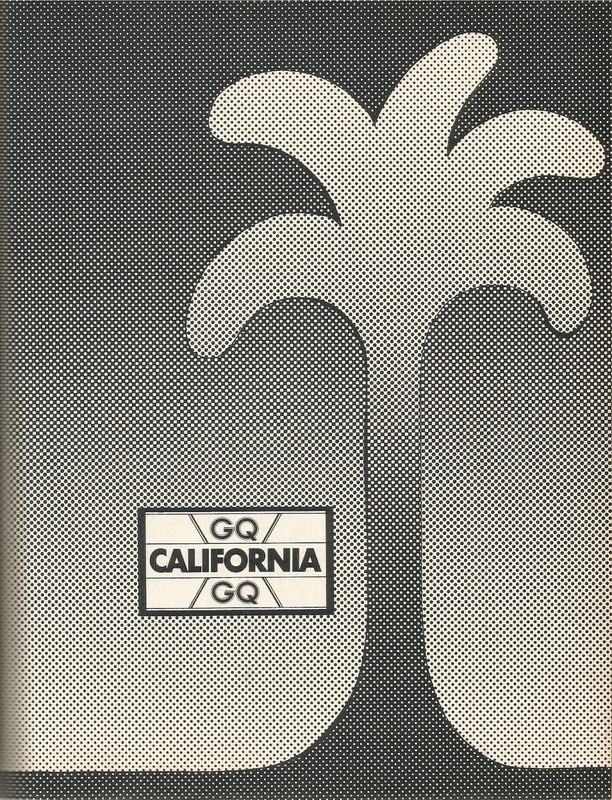 Is It True What They Say About California?